California got hit by a big storm. It was actually a series of storms that started last Friday and ended late Tuesday, but it felt like one long storm because there was little break between the systems. We didn’t see the sun in Mariposa from Friday until Tuesday. 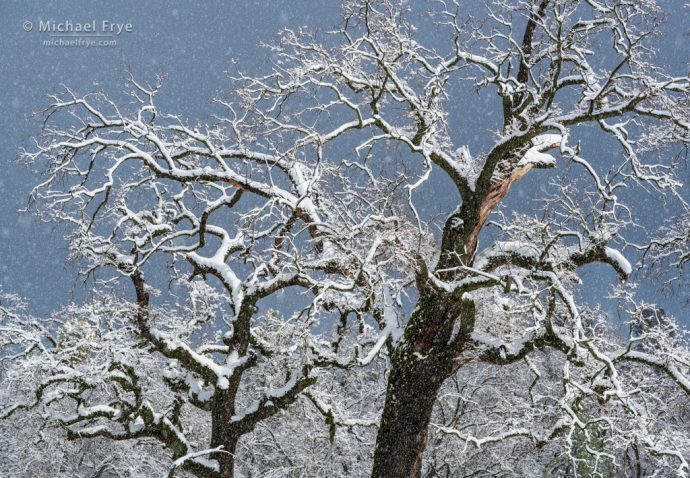 Yosemite Valley received 8 1/2 inches of precipitation (rain and snow equivalent) since Friday. That’s the largest amount I remember seeing over such a short period. (There was probably more rain during the ’97 flood, but I didn’t pay attention to the rain totals then). In the beginning the temperatures were warm, so it rained at the 4,000-foot elevation in Yosemite Valley. But on Saturday, Sunday, and Monday the temperatures hovered near freezing, bringing some wet snow, then rain, then more wet snow. Late Monday the thermometer dropped further, and by midday Tuesday there was over two feet of snow on the valley floor. Of course at higher elevations it was all snow. Mammoth Mountain, just 32 miles southeast of Yosemite Valley, got 7 1/2 to 11 feet of snow. Tuolumne Meadows, at 8,600 feet in the Yosemite high country, got 97 inches of new snow (about eight feet). I watched the storms closely. It was a really interesting weather event, but I also wanted to see whether it might snow in Yosemite Valley, and when the storm might clear. By Sunday all the forecasts indicated that the storm would probably clear on Tuesday afternoon or evening. 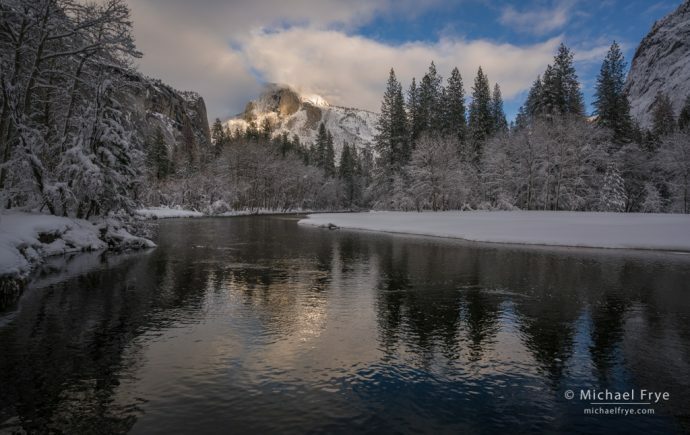 But some forecasts also indicated the possibility that Yosemite Valley could get a lot of snow – perhaps two to three feet. 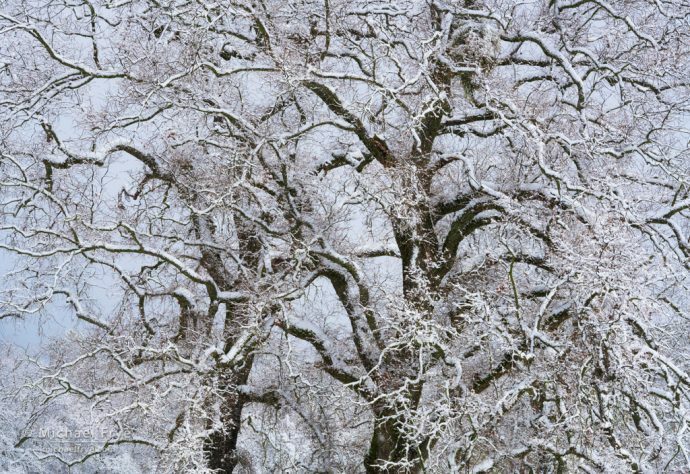 “Snowmageddon” closed the park for a week as crews fixed downed power lines and cleared the roads of fallen oak limbs. As I watched this recent storm and looked at the forecasts, I knew that if the valley got a lot of snow the roads would probably close. And even if they stayed open, driving and walking around would be difficult. By Monday afternoon the only road open into the valley was Highway 140. That evening the park service closed all the roads, and advised visitors and employees in the valley to stay inside to avoid falling limbs. Tuesday morning the valley looked quite snowy on the webcams, but it was hard to tell how much snow was on the ground. One second-hand report I got said 2 1/2 feet. The roads were still closed, so I couldn’t go see for myself. At around 3:00 p.m. I could see sunlight hitting Yosemite Valley on the webcams. It looked beautiful, but the roads were still closed. So I decided to drive up a local mountain to see if I could get a view east toward the mountains as the storm was clearing. 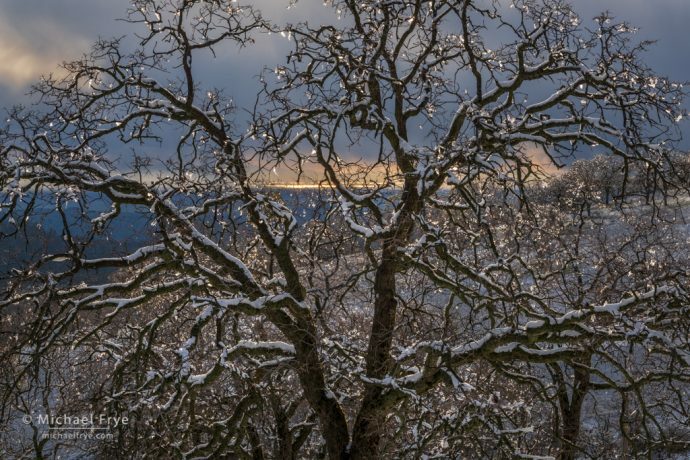 But I never made it to the top of the mountain, because on the drive up I saw some beautiful, backlit oaks. 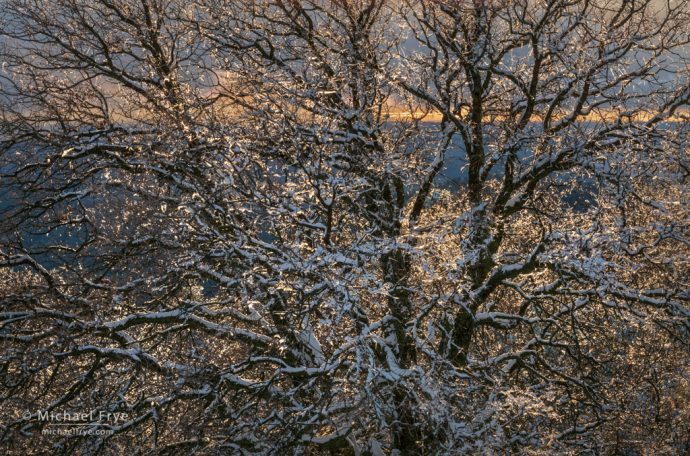 Snow had melted from their branches and left clumps of ice, glittering like Christmas ornaments in the late-afternoon light. 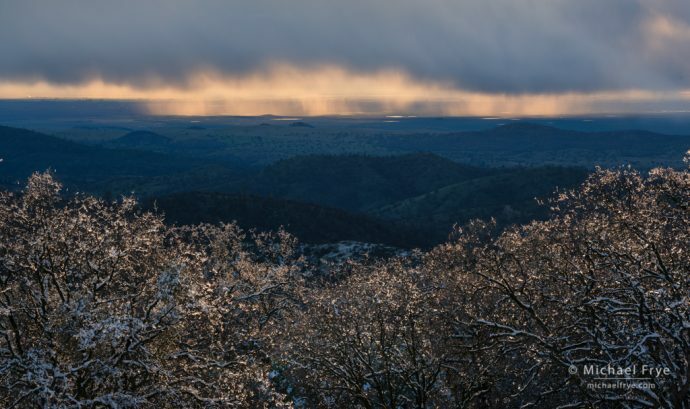 Rain squall over the Central Valley from the Sierra foothills, Mariposa County, CA, USA. You can see sunlight reflecting off storm-created ponds in the valley floor. At noon on Wednesday the roads into Yosemite Valley reopened, so I decided to go see all the new snow. And there was a lot of it. I measured 22 inches in Sentinel Meadow, but it had probably melted and settled a bit by then, so I’m sure there was over two feet on the ground the day before. 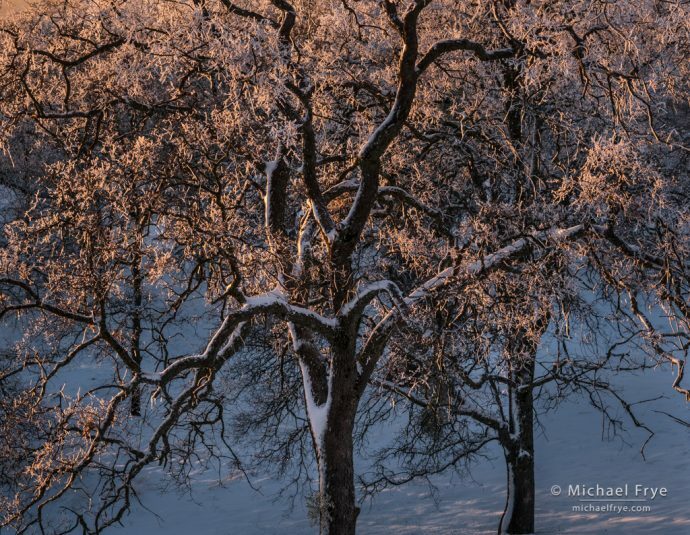 Although I didn’t get to photograph the clearing storm in Yosemite Valley, I was very happy with what I did get to photograph – especially the backlit, ice-coated oaks Tuesday evening. And it was an epic storm that I’ll long remember. 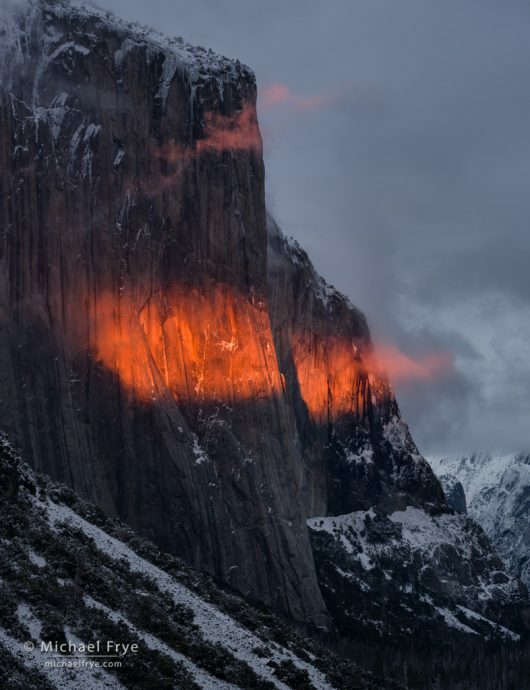 Hi Michael, I’ll be heading to the Yosemite Valley later this month to (hopefully) capture the Horsetail fall at sunset (after all the snow and dipping temperature, not sure if there is any water in the falls though). 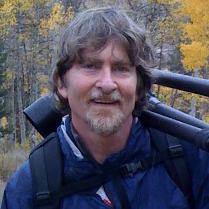 Your images and, of course, the story behind them, have always been my source of inspiration for landscape photography. All your books have been the most practical source of knowledge for me. 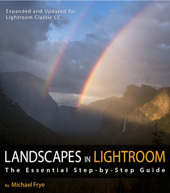 Just completed reading the “Landscapes in Lightroom” book … I think it’s the most practical book written on Lightroom till date. Thank you so much! Best regards! Thanks for all the kind words Sudipta! Snow is good for Horsetail Fall. Without snow on top of El Cap there is no water in Horsetail. If temps are cold that will limit melting and diminish the flow, but there will be some water in the fall, which wasn’t the case last year. And temps now don’t indicate temps in the future. Thank you for the storm story. Knowing the roads were closed made me feel better about being eight hours away. I too watched the web cam, and appreciate the time-lapse. Maybe the next front will leave roads open. My favorite of your images is the fourth, but enjoy them all. Thanks Gery. Not as much snow expected this weekend, but it could still amount to quite a bit. We’ll see. Great captures from our recent stormy weather, Michael! What I often enjoy the most is your narrative of what you and Claudia joyfully go through to gather such memorable photos. As always, thanks for the visual majesty. Thanks John! Yes, more snow is on the way. While perhaps less than the last storm it could still amount to quite a bit; the NWS is saying one to two feet. Be prepared for some difficult driving conditions. Yes, for anyone thinking of going to Yosemite this weekend, there’s a lot of snow in the forecast, which could make driving very difficult. The NWS has upped their snow prediction to 30 inches for Yosemite Valley over the weekend. Other sources are a little less bullish, saying 20 to 24 inches, but that’s still a lot. It’s possible the roads could close again. Thanks, Michael! I’ve been reading about the big storms in Northern California, but didn’t realize that so much snow had fallen in the Sierra. Your time-lapse webcam is amazing! 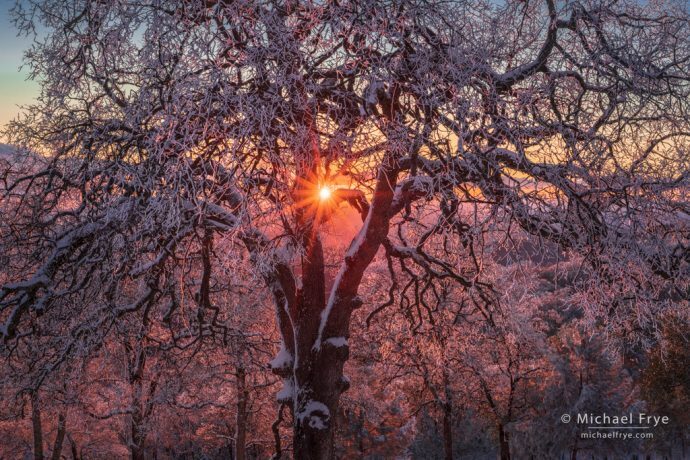 The backlit oak tree image is just lovely. Appreciate very much each time you give us your information. Thanks.